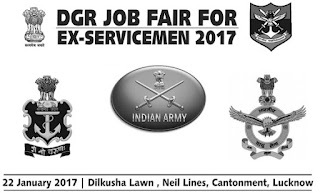 Indian Army Job Fair for Ex Serviceman at Dilkusha Lawn, Neil Lines, Cantonment, Lucknow. The Stalls will be provided free of cost on first come basis. in addition necessary infrastructre and any additional facility required will also be made available for conduct of any type of tests for selection and Recruitment of Ex-serviceman. On the spot registration will be available up to 1 PM at the vanue for Ex-serviceman who have missed online registration.